December is here so I’d like to reflect back on 2013 and share some innovative art ideas that came from YOU and never made it into a blog post. 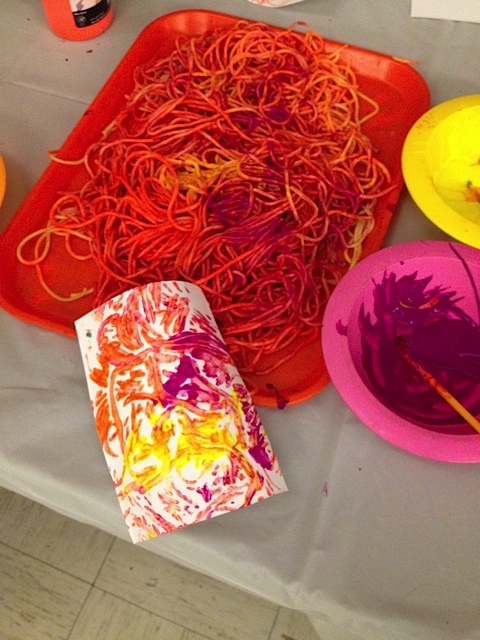 The above photo is Printmaking with BioColor® on painted spaghetti, and other innovations follow. I hope you are inspired to try some of these soon. 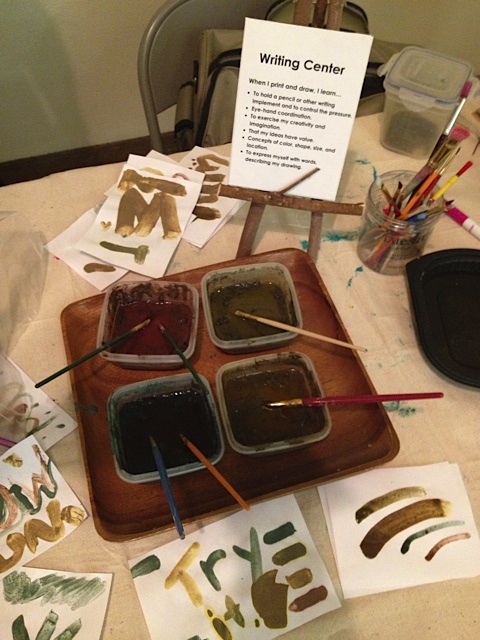 Mud Painting with Colorations® Liquid Watercolor™ Paint added into the mud with Colorations® Liquid Watercolor™ paint on Cooperative Mural Art Material. 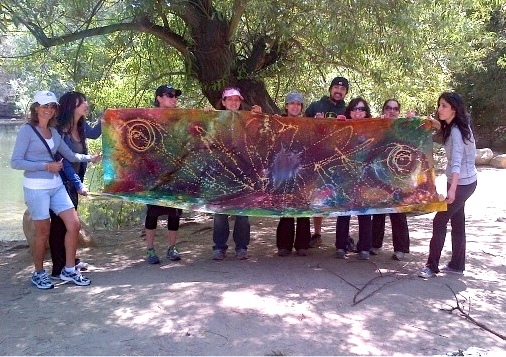 Color Spray Mural Team Building (click here for lesson plan) Staff Development Team Building at Pressman Academy. 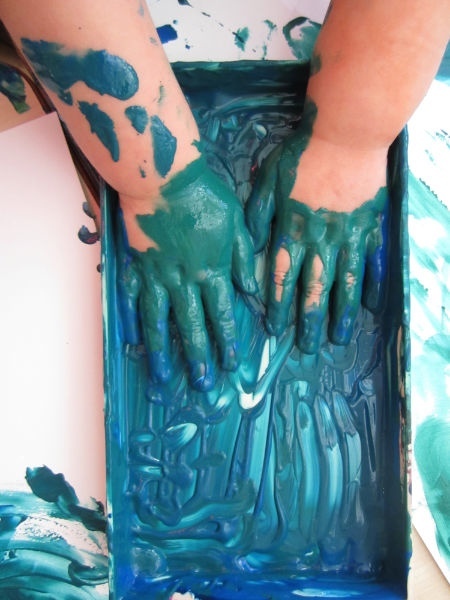 Toddler Messy Art with Colorations® Simply Washable Tempera. 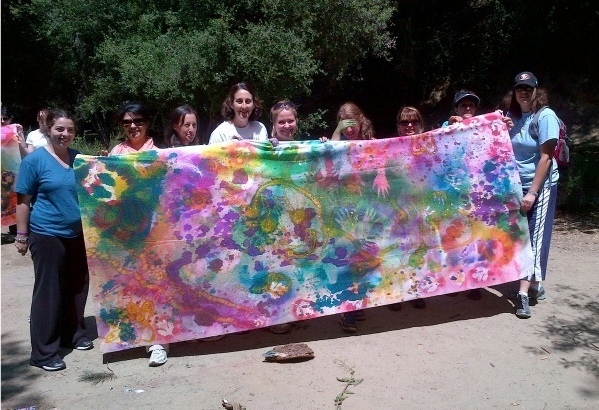 Community Paint Run by Ugly Dog Events using Colorations® Powdered Tempera. 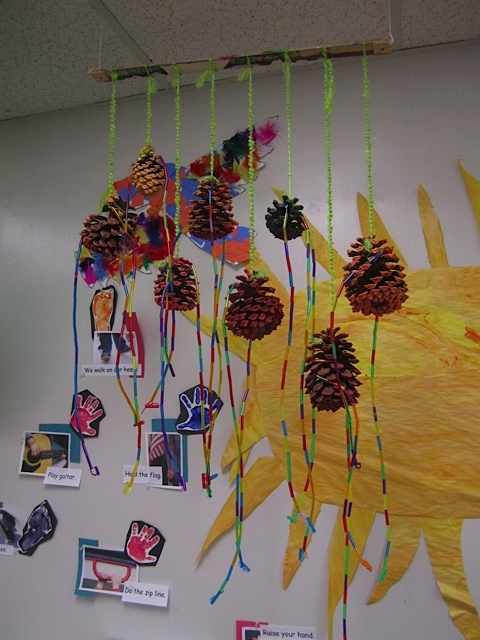 Painted Pinecone Mobile with Stringing Straw Beads on a branch. I’m very grateful for the opportunity to write this blog, it’s always fun to be on the lookout for innovative art ideas. My thanks go out to Discount School Supply® for having the vision to start this blog five years ago. Their intention was to have me collect and share ideas on how to use Colorations® products with continuous innovation, and I work hard to live up to the task. More importantly, my thanks go out to you, the parents, teachers and early childhood program directors who read my monthly posts. Without you there would be no Arts & Creativity community. 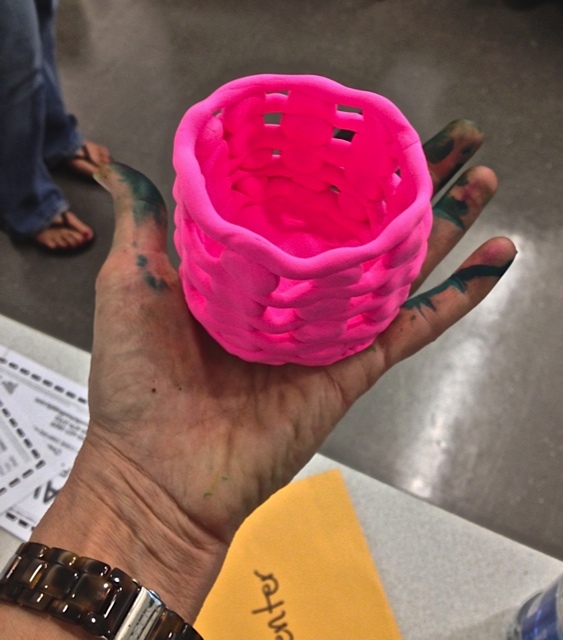 I love that you join me in sharing your own ideas and spreading the word about the value of art in education. Thank you. PS – Special thanks to Monica Marshall and Kathy Walker from College of the Canyons CDC, the always innovative Danielle Monroy of Creative Care for Children and the awesome Mona and other ECE staff of Pressman Academy. I just got back from a much needed summer vacation and was reminded that I need more NATURE in my life! Since I’ve attended numerous “Outdoor Classroom” workshops, and learned about the negative effects of “nature deficit” on today’s children, it was good to be reminded that I too find nature incredibly inspiring. On my vacation, I renewed my love affair with the sensory world of the forest. 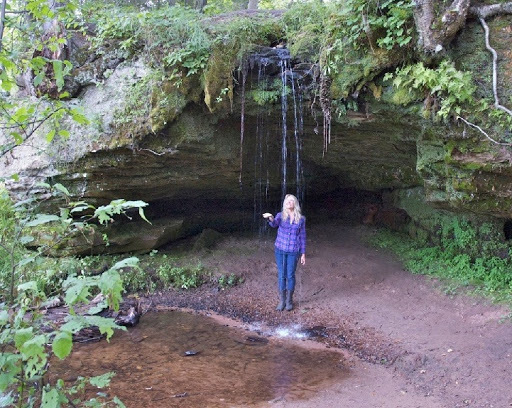 I fell in love with colored rocks, birch trees and waterfalls. It was all so simple, yet profoundly restorative. 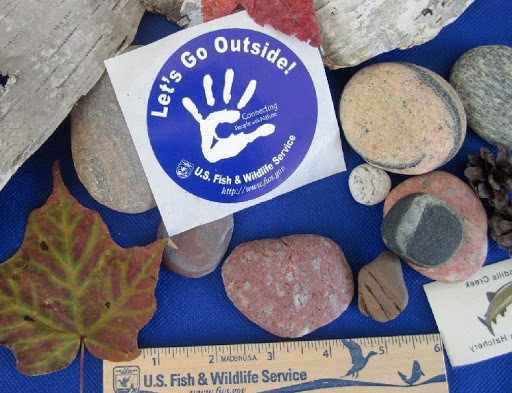 As an educator, I was inspired by what I might bring back from my nature vacation to include in the classroom. There were so many things to choose from! 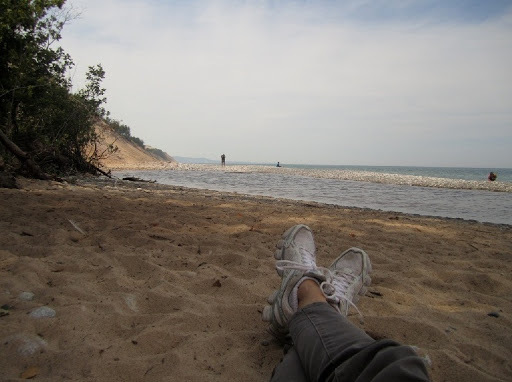 Moreover, having this “take home task” on my mind helped me engage all the more in my natural surroundings. 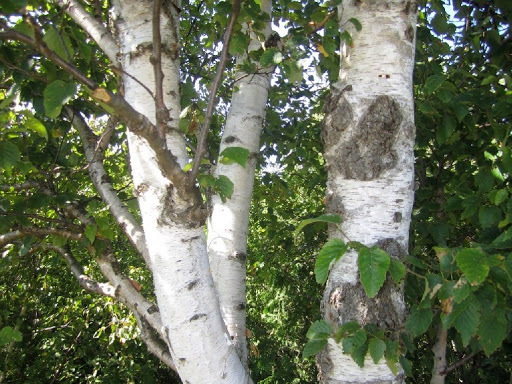 Trees were just beginning to show off their Fall colors, and the white birch trees were especially lovely. 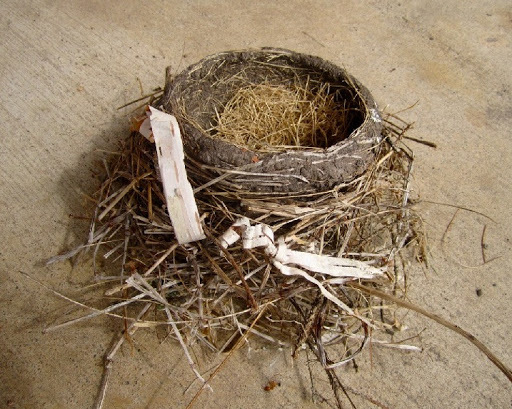 Imagine how excited I was to find this abandoned bird’s nest, all intact and perfectly formed! The woven strips of birch bark in the nest gave me an idea, and I picked up fallen strips of bark to take home and use as collage. 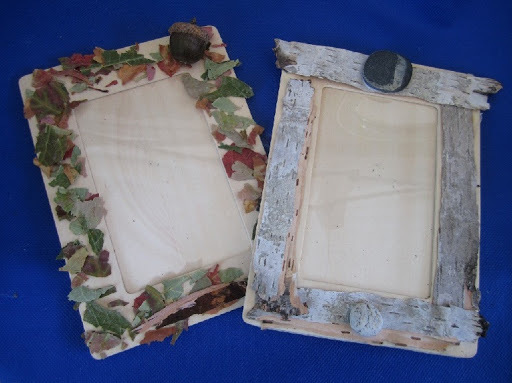 When I got home I tore strips of white bark and used Tacky Glue to mount it onto wooden picture frames, adding colored rocks as accents. How fun! 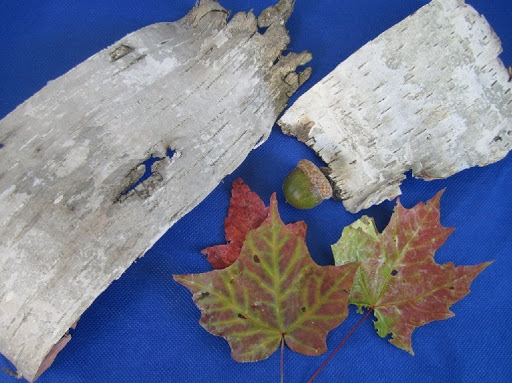 I was amazed to find that birch bark tears along a seam just like fabric does, so you don’t need scissors to cut it. Such are the discoveries that excite me, and I bet you as well. We also visited several lakes and found an abundance of beautiful colored rocks around the larger lakes. 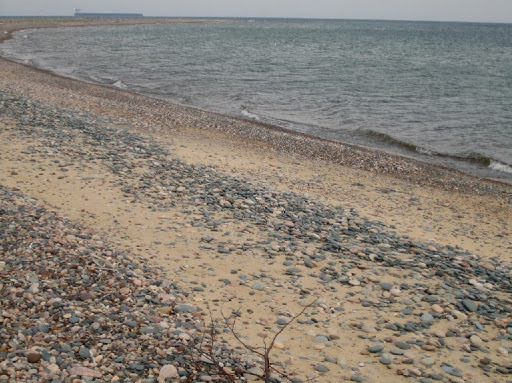 Many local artisans made creative use of these naturally colored rocks that were a signature of the local geology. 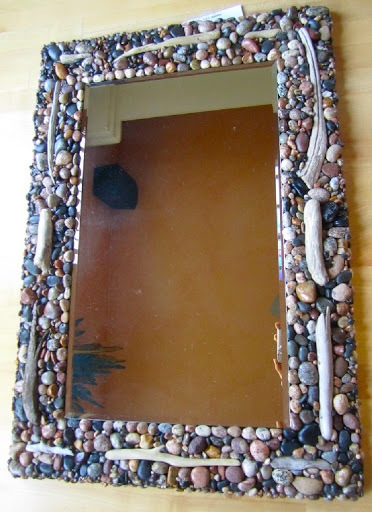 Here’s a large rock and driftwood mirror that I couldn’t resist purchasing. I hoped it would remind me to make nature a regular part of my life once I returned home to the city. 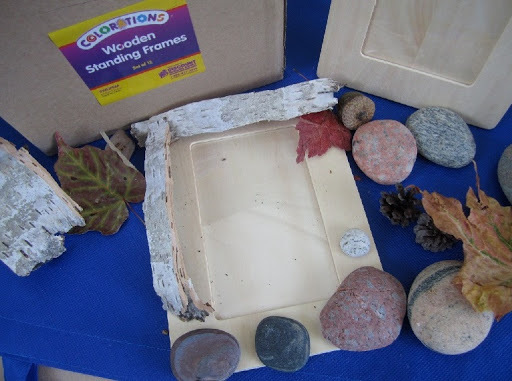 Later, I tried duplicating this idea of rocks as collage material on top of wooden picture frames. The rocks I brought were a little too large so I used them as accents and made a mental note to check out the Home Depot garden department for smaller pebbles. Or better yet, find a local hike where I could collect smaller rocks on my own home turf. 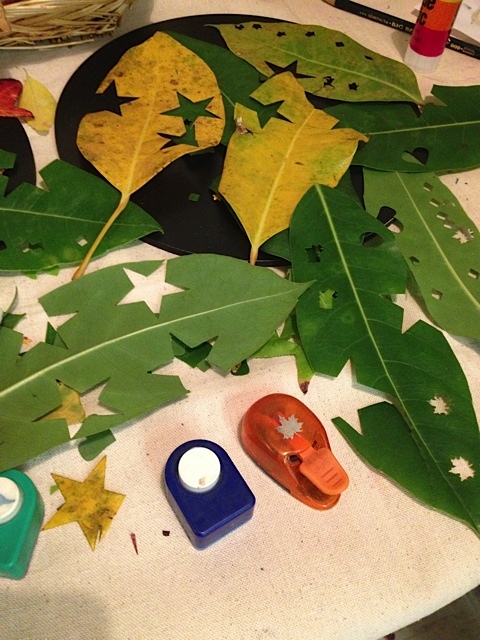 I was eager to make “Leaf Glitter” for a second collage project and had collected just a few Sugar Maple Leaves with tinges of red and yellow. 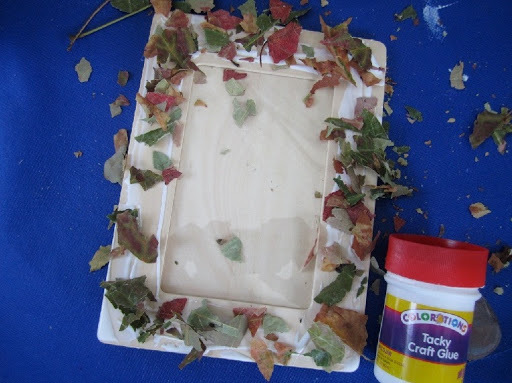 Once they had dried, I made Leaf Glitter by simply crunching up the dried leaves, which were then glued onto the picture frame. 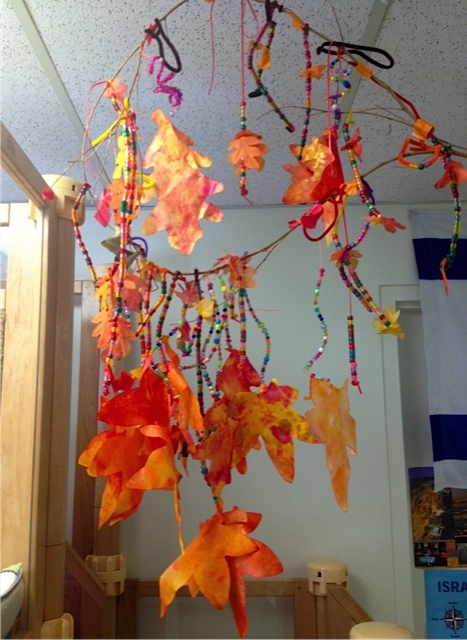 When I do this in a classroom, I’ll ask children to sort the dried leaves by colors first, then crunch them into separate bowls so they’ll have yellow, red, brown and orange Leaf Glitter to work with. Together these two experiments in nature collage make a nice pair, don’t you think? 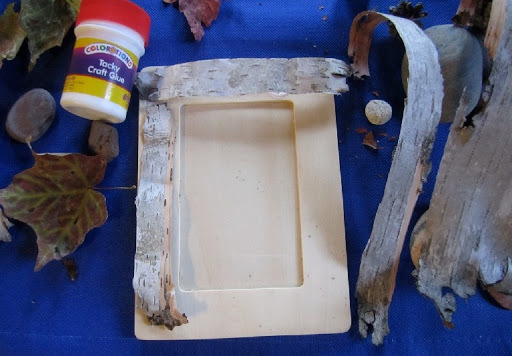 I realized I could extend the activity by first “staining” the wooden base frames with wet tea bags or another natural colorant before gluing items on top. How fortunate I feel to have been able to replenish myself before the beginning of a busy school year. I hope you were also able to restore yourself, and will continue to do so on your weekend time. It’s so important. Maybe we will run into each other at an Education Conference soon or at NAEYC where I’m presenting “Art as a Language with Children.” Please attend if you can! Most importantly, I want to thank you for reading my Blog and being a part of the Art and Creativity community. I hope you have a wonderful new school year full of passion and promise. To life! Craft Stick Faces: More than Just Smiles! 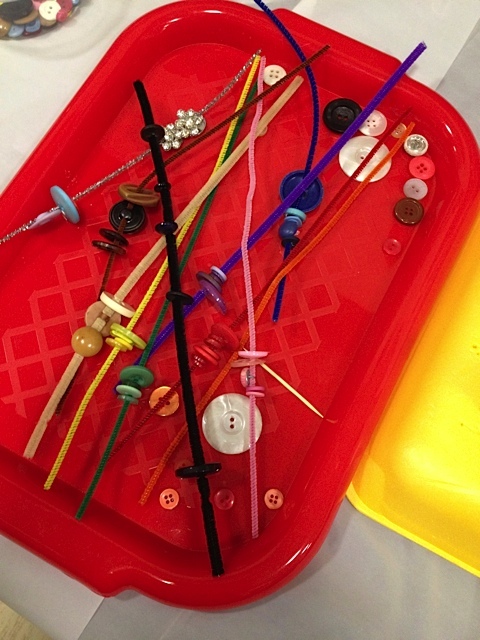 Teachers had a great time making Craft Stick Faces at the Discount School Supply NAEYC booth last week, and this economical craft project is SO creative! Collage materials of all sorts adhere easily to the blank wooden craft stick faces, and design possibilities are endless. Try out a few new collage materials, and combine them with what you already have on hand. This project is small enough that you can use up bits and pieces of fabric scraps, yarns, dried beans, or any number of crafty odds and ends. A variety of collage elements will inspire unique designs. 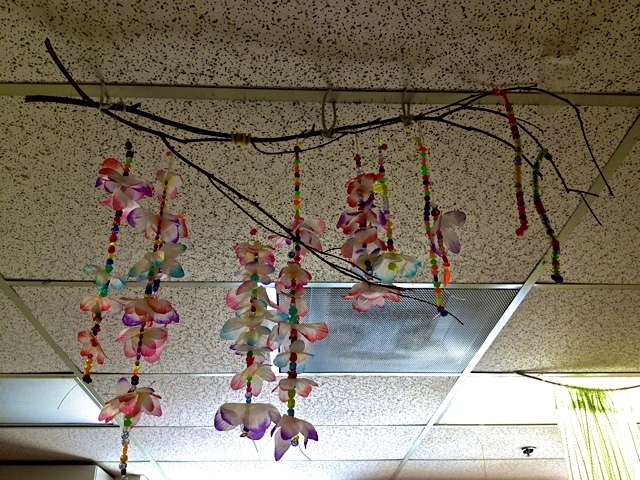 Take a look at some of these creative ideas, and imagine the fun your children will have. Turn Craft Stick Faces into “self portraits,” use them in dramatic play as puppet figures, or introduce them as a way to help children express their feelings. One teacher at NAEYC created a happy face on one side, and a sad face on the other side, I really loved THAT idea! There’s nothing like an arts & crafts break during a long conference to help people relax and enjoy themselves. To get this particular range of collage effects, see the recommended materials below. I especially recommend the wonderful Tacky Glue Pens, which you’ll use often in other classroom projects. You’ll also love the Fantastic Foam Stickers – they are bright, fun shapes that stick to any surface and are easy for young children to manipulate. These products are what I call “incredible values” that you’ll use with pleasure, again and again. Thanks for checking in, I hope you enjoy the NAEYC photos! Rainbow Feathers Classroom Pack – 8 oz. Anna Reyner is a nationally recognized arts advocate who is dedicated to helping people get in touch with their own creativity. 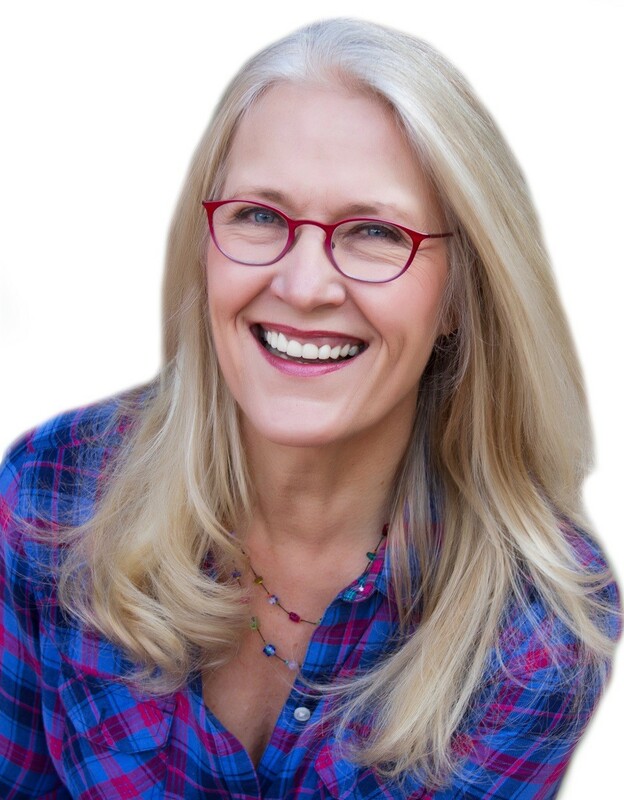 Anna has conducted over 500 national and international hands-on art workshops and is a registered art therapist and licensed marriage and family therapist. She received her MA in Art Therapy from the University of Louisville and her BA in Art and Psychology from Ohio Wesleyan. 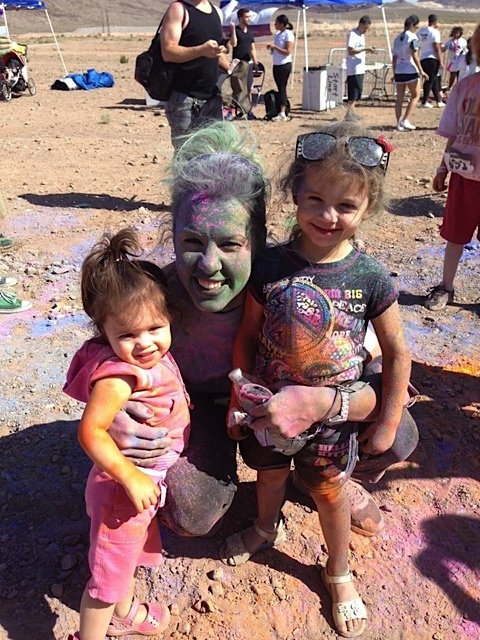 Anna is the Director of Training for Discount School Supply and maintains an active art studio in Los Angeles where she lives with her husband and two children. 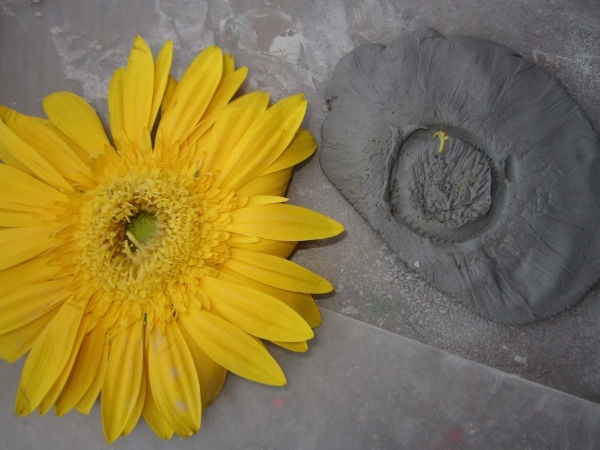 And learn more about the workshops Anna offers!